Good morning! Happy Christmas Eve! 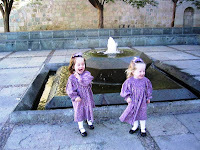 Today, while I celebrate Christmas Eve in Maryland, I'm thinking of some of my favorite holiday traditions from Mexico. I lived in Mexico for 10 years. 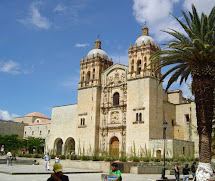 A large part of that time, I lived in Oaxaca, a UNESCO heritage site, located in southern Mexico. 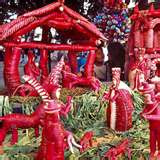 Noche de Rabanos, Night of the Radishes, is a wonderful Oaxacan tradition held on December 23 every year. The tradition dates back to colonial times, when missionaries taught natives how to cultivate radishes, which grow to extraordinary sizes. Today the radishes are grown locally and are carved into amazing works of art. 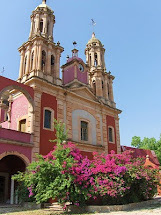 The festival is held in the Zocalo, Oaxaca’s Main Square, in front of the Government Palace. A great exhibition of figures made of radishes is on display. Figures of animals, humans, saints, and other characters are made using only the radish! Artists are rewarded for their ingenuity and skill through a variety of contests. Corn husks and a dried flower called "totomoxtle" are also made into beautiful designs. After you enjoy the sights of the radishes, you can enjoy a buñuelo, fried dough bathed in a sugary syrup and some world famous Oaxacan hot chocolate at one of the cafes in the main square. My favorite is the Jardin. 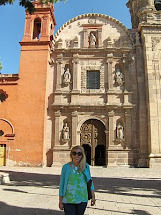 I’ll share more about my adventures in Oaxaca in other blog posts.